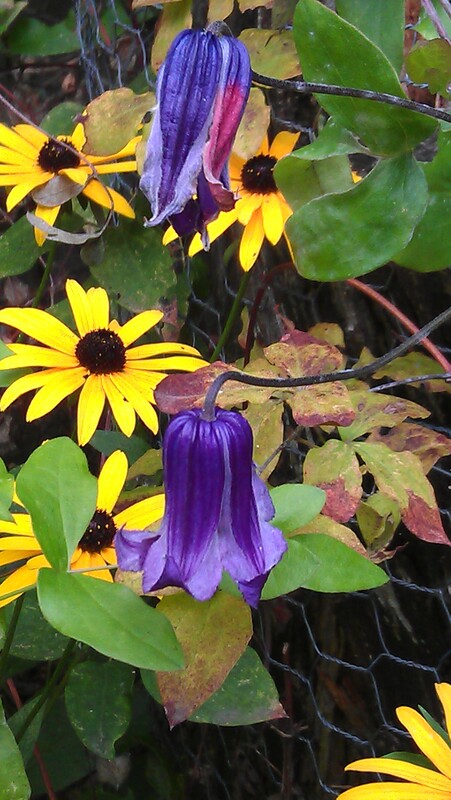 Do you have a clematis to plant this fall? 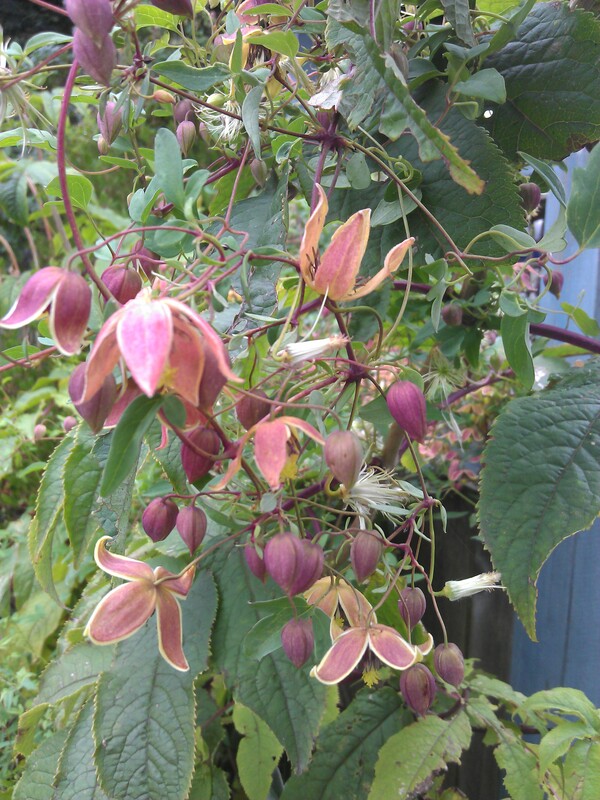 If not, you still have time to scour the nurseries for a likely specimen (see my recent post on how to choose a nursery clematis in the fall). Yesterday, I planted a nursery plant myself, so let me show you how I did it. 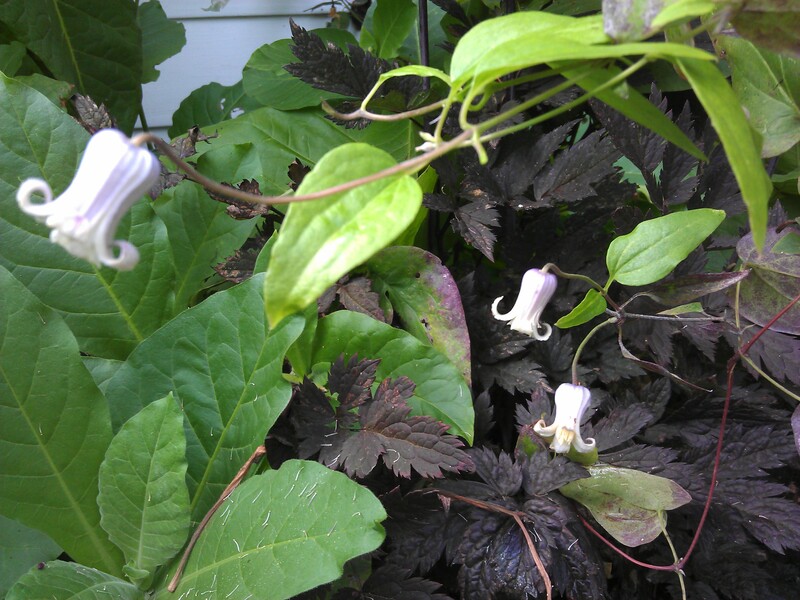 Sometime last summer, I purchased Clematis Sunny Sky (see photo right) from a nursery that had all its clematis out in full sun, which is very hard on clematis still in pots. 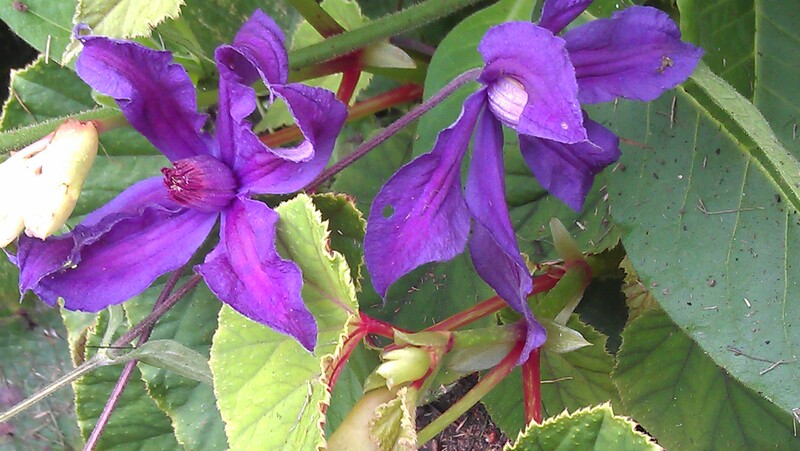 This one looked really cooked, but I used my smart phone to look it up on Clematis on the Web. 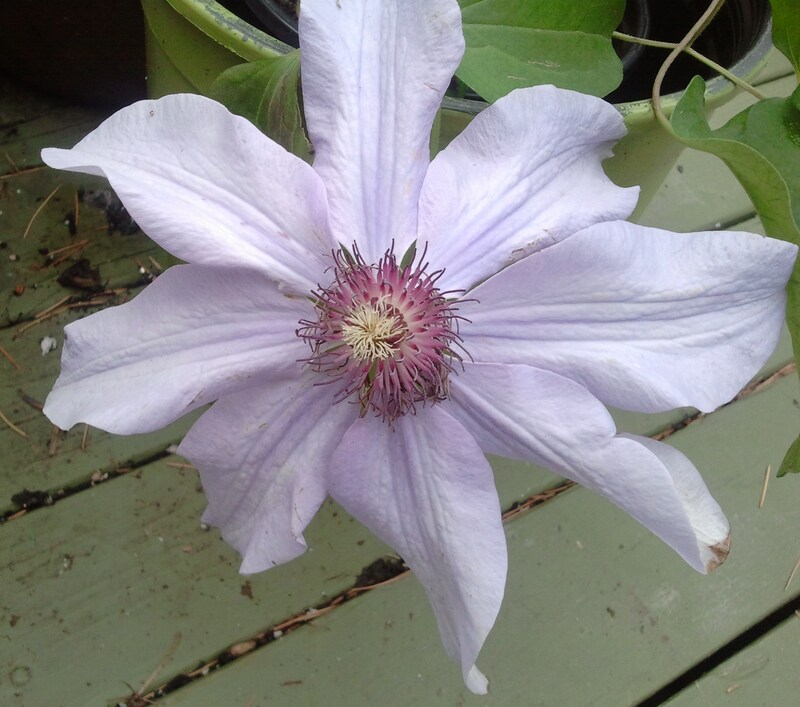 I found that it is a vigorous and floriferous clematis that will grow to about 4 – 6 feet tall and needs full sun, so of course I took it home. Below are the steps I followed to plant it. 1. 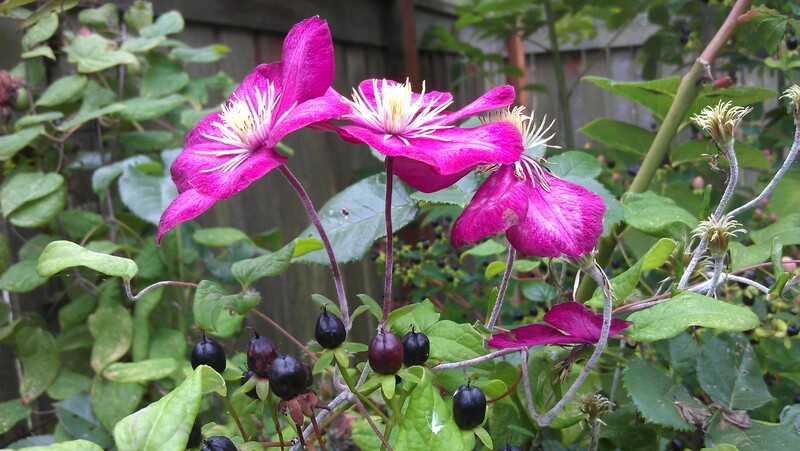 Find a suitable spot to plant the clematis. 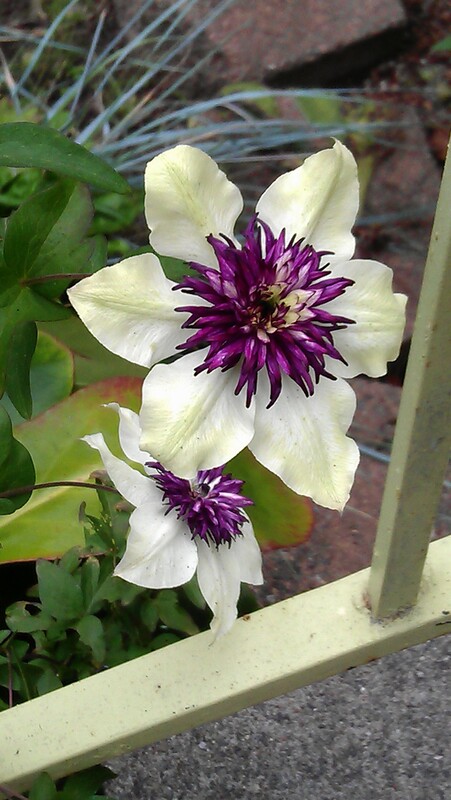 I walked around my garden and found a sunny spot where I thought this clematis could add some pizazz near a yellow rose (Rosa ‘Jude the Obscure’)–they should make a charming pairing. 2. Soak the c lematis. 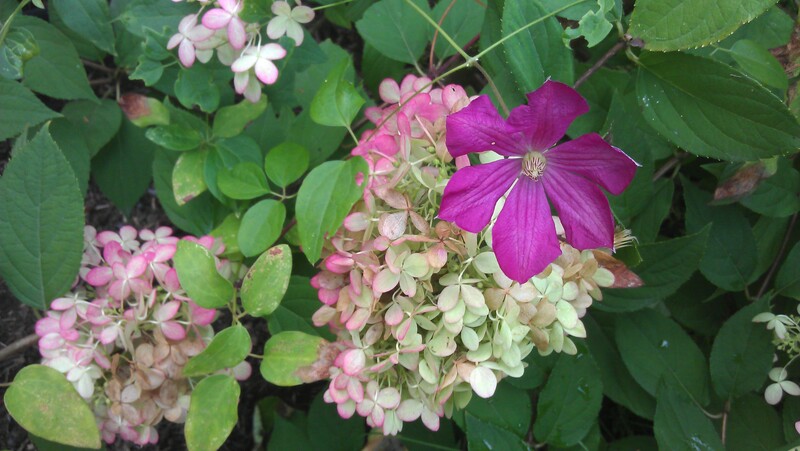 The easiest way is to fill a bucket with water and plunk the clematis in — pot and all — while you dig the hole. 3. Dig a large hole. Make the hole as big as you can–some say at least 2′ x 2′, but that’s a honking big hole that we can’t always fit into our gardens. But do try to make the hole at least twice as deep and twice as wide as the pot. See my hole to the right–it’s about 18″ deep and 15″ wide. 4. Fill hole with water and let drain out. This serves two purposes: it lets you know how fast the area drains and it hydrates the soil down deep. 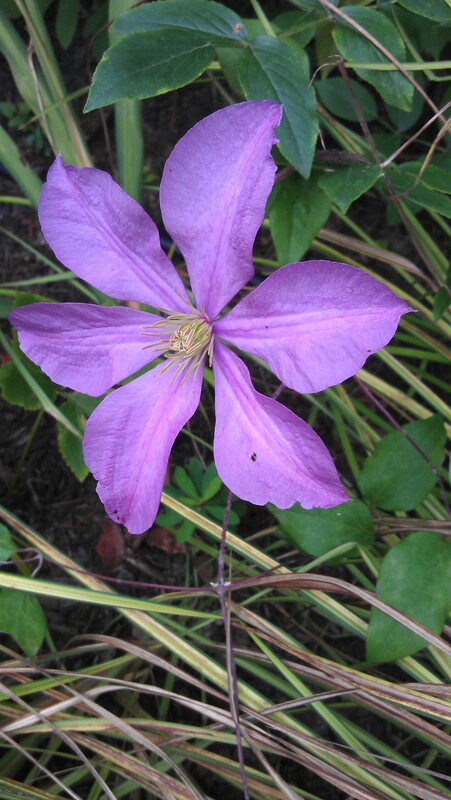 If the water drains so fast you can’t even fill the hole or if it drains out just in a few minutes, the drainage is probably too fast for most clematis. If it takes more than two or three hours to drain, it’s probably too slow. When I dug this hole, the bottom 12 inches of soil were still fairly dry from our summer drought, so I filled it twice. The water drained in about 20 minutes both times. 5. 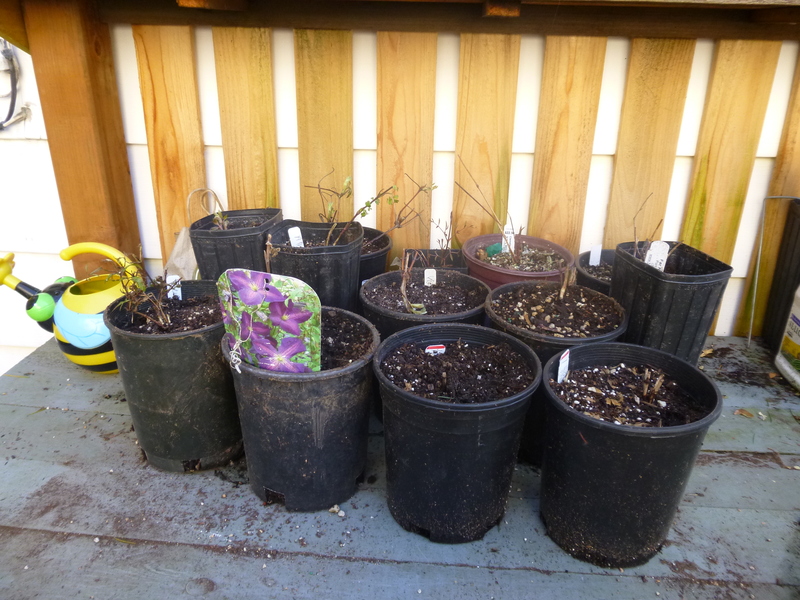 Plant the Clematis. First, I put 2″ of manure (usually fresh or composted steer manure) in the bottom of the hole (a jolt of food for the clematis two or three years down the road). I covered that with about 2″ of native soil mixed with compost. 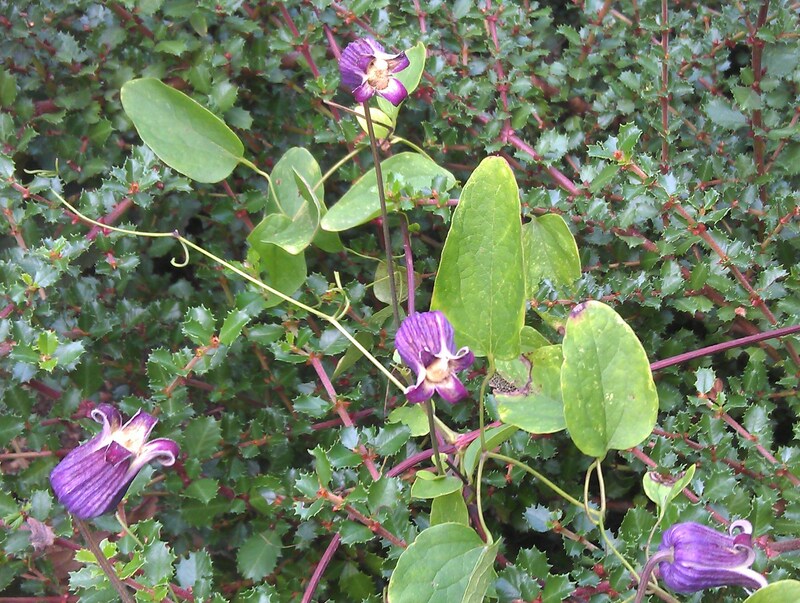 Before removing a clematis from its pot, first remove any bamboo or stick stapled to the side of the pot. Otherwise, getting the plant out of the pot can be a struggle. Set the plant in the hole so that the crown is level with or just below the soil level. If the plant is too low, take it out and add more soil to the hole. If it’s too high, either remove some soil from the hole or loosen the roots on the bottom of the plant and remove some of that soil. Once the plant is at the right height in the hole, fill in with a mixture of native soil and compost — I also like to ad a little alphalfa meal and bone meal. Tamp down and water. 6. Final Touches. Cover the soil around the plant with at least 2″ of compost. 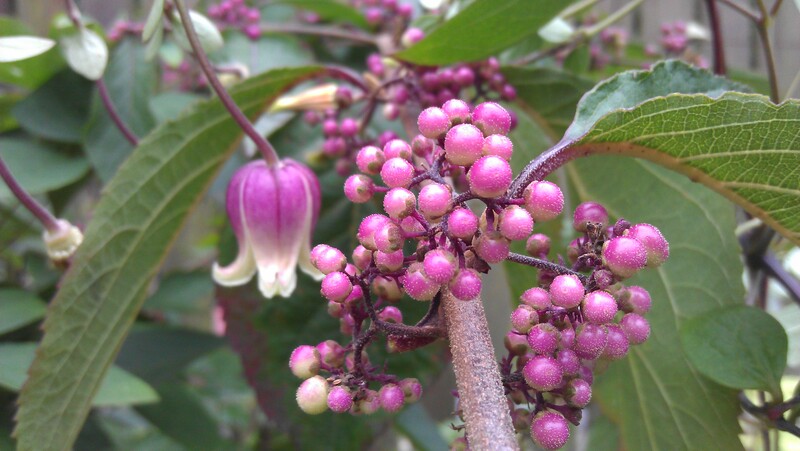 Cut the plant ba ck to 6 – 12″ tall to encourage root growth over the winter. I plan for C. ‘Sunny Sky’ to weave through the shrubs around it. 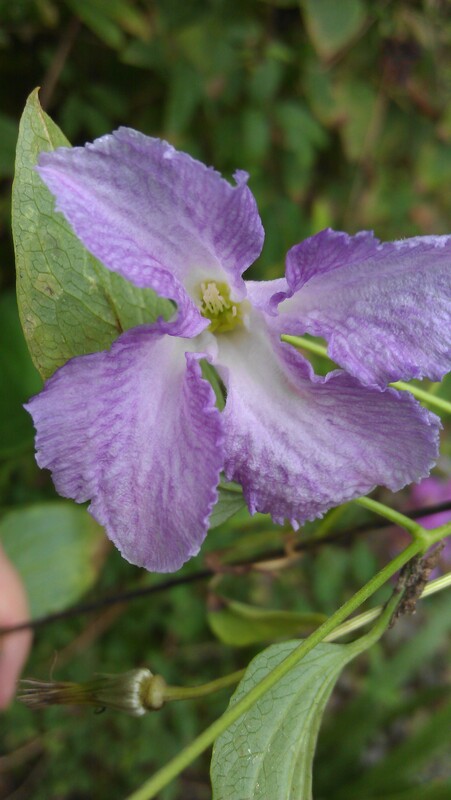 This particular clematis does not climb–rather it lounges about on whatever support it can find or it sprawls on the ground. 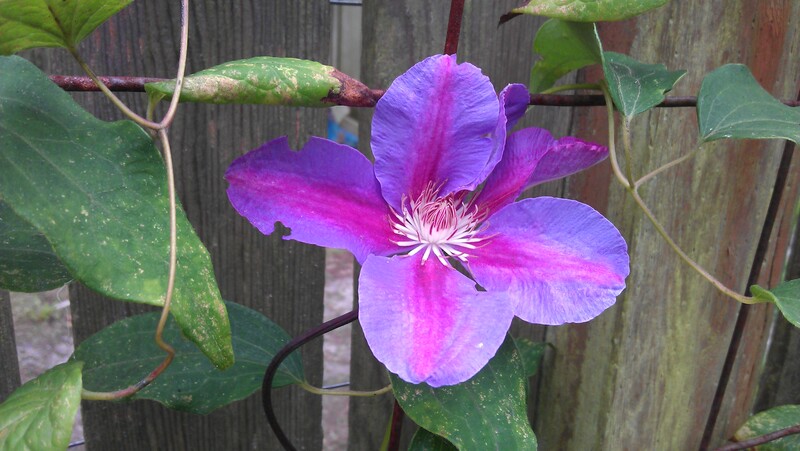 I inserted a small bamboo stick into the hole, to which I can tie the clematis to as it grows and, hopefully, guide it to the shrub in which I want it to lounge. Once it reaches the shrub, it’s on its own. If yours is a climber that you want to ascend a structure, you must also put something in the hole to give it a leg up onto its new support. The support structure should be in place when you plant, if at all possible. Make sure that the support (such as a trellis, arbor, or fence) has skinny bits — no thicker than your little finger — for your climber to cling to. If your support does not have anything thin enough, you can attach chicken wire, string, or some other thin thing to it. 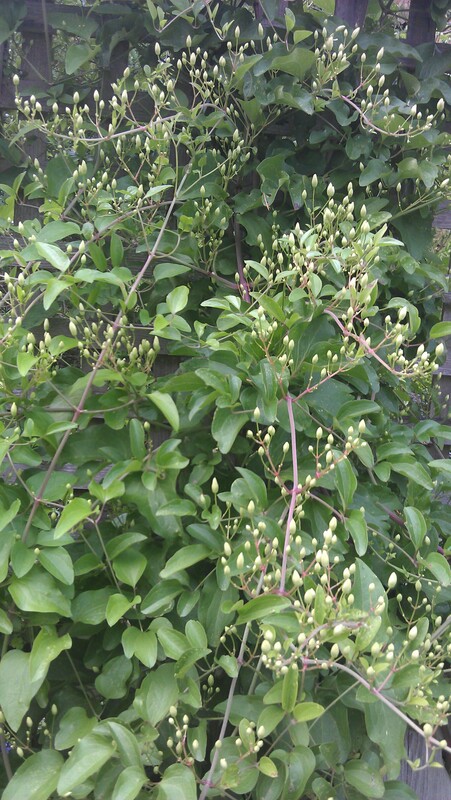 I’ll post photos of C. ‘Sunny Sky’ when it blooms next summer. Send me photos of yours, too!